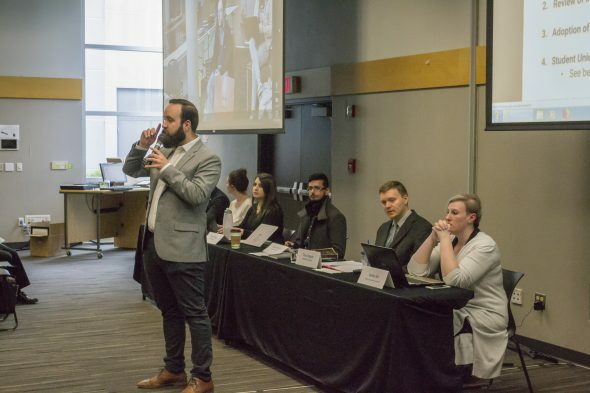 Despite making a significant effort to draw in students, the Kwantlen Student Association did not reach the quorum of 200 student voters necessary to update the association’s bylaws at its annual general meeting on March 27. The meeting was held in the Surrey conference centre and was accessible through a teleconference on each of the other KPU campuses. The KSA worked hard to increase their chances of reaching quorum for this meeting. Singh says that the strategy they employed was to engage international students in particular due to the recent surge in international enrolment at KPU. To that end, the KSA held a turban-tying contest in the Surrey courtyard before the meeting, as well as a bhangra performance in the conference centre immediately prior to the start of the AGM. Snacks including samosas and spring rolls were also provided throughout the two-hour meeting. In total, the KSA was able to to attract approximately 350 students to register throughout the day. Unfortunately, many attendees left after the opening bhangra performance and attendance fluctuated as students filtered in and out of the conference centre. By the time that the voting portion of the meeting was starting, fewer than the required 200 students were in the room. The failure to make quorum meant that the KSA was unable to adopt the proposed changes to its bylaws. Among those changes was a measure to amend the definition of a current student from someone who has registered for classes within the last semester to within the past three semesters. The proposed bylaws would have also changed the number of students required to make quorum at future meetings from 200 to 150. Perhaps most importantly, the KSA were hoping to add a provision to the bylaws that would allow members of its council to to receive an honorarium for their work. While KSA councillors currently receive pay for attending meetings, and members of the executive committee are paid a regular salary, recent changes to the B.C. Societies Act require that payment for directors be explicitly outlined in a society’s bylaws. As the KSA’s current bylaws do not make mention of payment, councillors may have to work without remuneration if the bylaws are not changed by November. Had the meeting made quorum, the KSA would have also passed a measure to wave student association fees for students who were formerly in foster care. This would have put the KSA in line with the provincial government, which passed a measure waving tuition fees for former youth in care last year. This measure by the KSA would have saved former foster children around $250-$300 in fees annually. This is not the first time that the KSA has failed to make quorum at their annual general meeting. In fact, this has happened each year for the past several years. As the KSA—and other student organizations at the university—have found, it is extremely difficult to get a large number of KPU students into one room. The KSA was still able to accomplish other business at the meeting, however. A vote was passed to renew the debenture authorization that allows the KSA to take out a loan for constructing its student union building. Singh says that the next step for this will be to hire a manager to oversee the project. The KSA also received and approved its audited financial statements for 2017 and appointed an auditor for 2018. Additionally, the association announced the release of the 2015 and 2016 Student Rights Centre reports, which detail student complaints with the institution and make recommendations for improvement. The KSA also recognized honorary memberships for three former presidents of the association: Christopher Girodat, Jessica Lar-son, and Allison Gonzalez. Finally, the KSA used the meeting to introduce the 2018-19 Council, the members of which were elected in February. Singh points out that many of the councillors are new this year. He is hopeful that they will represent a new era for the KSA. Singh says that the KSA will be holding a special general meeting in September to try to change the bylaws once more. He believes that the KSA needs to put more focus on getting students at other campuses to the event. Most importantly, he says that all KSA councillors need to be engaged with the event and KPU community in order for the meeting to be successful.